Some days I just lose hope in humanity. Around 300 Chinese workers who manufacture XBox consoles took to a factory roof and threatened bosses with mass suicide over a dispute about pay, unconfirmed reports have claimed. The workers were employed at the Foxconn Technology Park in Wuhan in Hubei province. Foxconn is an independent, global manufacturing partner to companies including Apple, Microsoft and Sony. Think how miserable you’d have to be to even make demands like this. 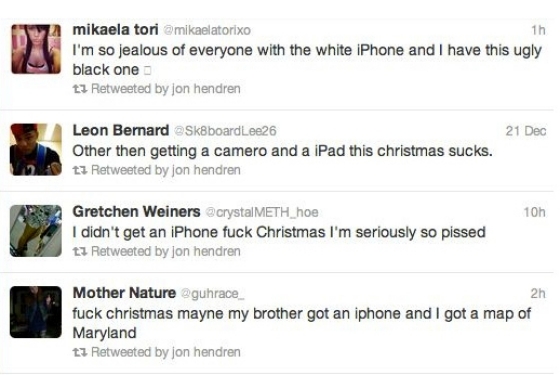 With this in mind, look at these tweets from American children, complaining how their parents didn’t buy them the latest iPad, iPhone, or XBox for Christmas. Across the world, those devices are being made by despondent Chinese workers, so poor and miserable that they’re threatening to kill themselves in mass by jumping from the factory roof. I had heard it was 150. Different sources seem to be reporting different numbers. I’ve been to Wuhan but never got to see Foxconn. There is a high turnover rate because they are repetitive manufacturing jobs, but if you compare the suicide rate based on the total number of Foxconn employees and then compare that percentage to the suicide rate of China as a whole, it’s actually a lot lower than that of the general population. Still, that does not excuse the bratty behavior of some spoiled American kids 🙂 But why pay attention to them anyway?